After 70 years of loyal and lifesaving service, the NHS deserves to be celebrated. But unless we can defend healthcare as a universal human right, we will always be fighting to preserve the NHS for future generations. Israel’s militarised repression of Gaza’s Great Return March has led Stop Arming Israel campaigners to renew their focus on UK complicity in Israel’s violence against Palestinians. Today’s EU agreement on migration is a ‘walls and fences’ agenda that has little to do with addressing the real drivers of migration. 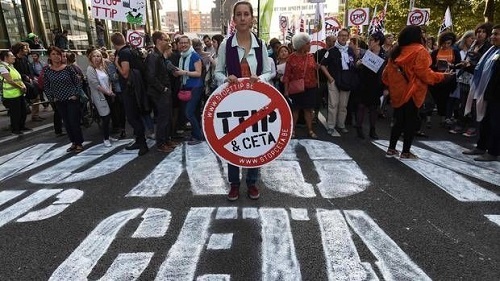 “Quite simply, CETA puts corporate power above democratic rule. It includes the notorious ‘corporate courts’ which give big business the power to sue countries for any policy they claim could affect their profits, even if it is vital to the public interest. CETA will threaten our ability to decide how we run our public services. The UK can't make up for the Windrush scandal without making reparations for the injustices of Britain’s colonial past.